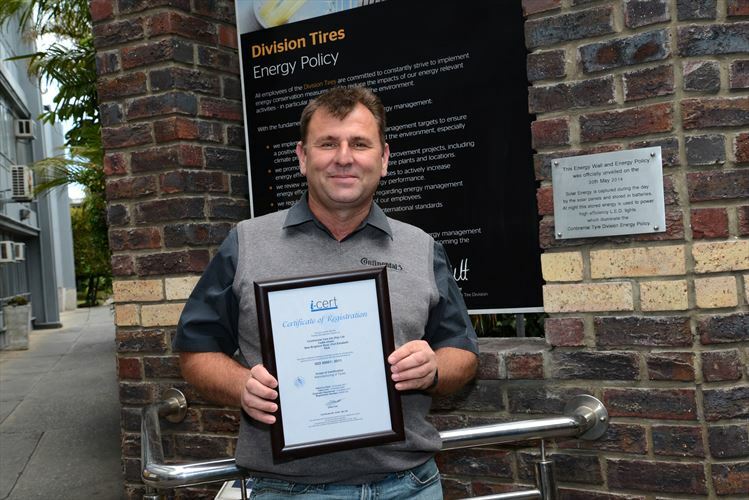 PORT ELIZABETH, South Africa,15 November 2017 – Continental Tyre South Africa (CTSA) has achieved a significant milestone by becoming the first local tyre manufacturer to achieve the internationally recognised ISO 50001: 2011 certification for the implementation of a comprehensive and far-reaching energy management system. The ISO 50001 certification specifies comprehensive requirements for establishing, implementing and maintaining an energy management system that results in continual improvement in energy performance, including measures to enhance energy efficiency and reduce consumption. “Receiving the ISO 50001 certification is a fantastic achievement for our local team, who initiated the project in February this year and worked tirelessly over the ensuing months to implement the necessary actions and systems,” says JJ Dowling, CTSA’s GM for Manufacturing. Globally, Continental has five other plants that are ISO 5000 conforming to the stringent requirements applicable to energy use and consumption. This includes accurate measurement, documentation and reporting, as well as design and procurement practices for equipment, systems, processes and personnel that contribute to greater energy performance. Aside from using an external consultant for guidance, all the procedures and user interface development was done in-house by the team at the Port Elizabeth plant, with the ISO Energy Management System fully integrated into Continental’s online energy monitoring system. This enables the team to have full control over the system and streamline all energy-related information into one software package. “Having ISO 50001 certification positions Continental Tyre SA as a leader in the local tyre manufacturing industry. It makes us fully compliant with world-class energy management systems, and places us ahead of the curve should this standard become a mandatory requirement in future from Continental’s global head office in Hannover, Germany,” Smith says.